I trust you’re having a wonderful summer! This month, I’m excited to share with you the first three commercials in the new Family Legacy Video® ad campaign. 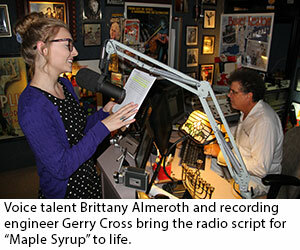 Family Legacy Video® is taking to the Tucson airwaves with its first radio commercial campaign. The spots, scripted by Family Legacy Video’s Steve Pender, were all inspired by storytellers Family Legacy Video has worked with over the years. Each spot features a family member describing favorite memories of an elder and then expressing thanks to Family Legacy Video for helping preserve, celebrate and share the elder’s stories (with a particular emphasis on the benefits for the grandkids). The first three commercials focus on World War II, maple sugaring, and woodworking. The campaign kicked off during the last two weeks of July. The spots will air during the last two months of each month, through December 2015, on KVOI (1030 AM) and KCEE (690 AM). Check out the commercials for yourself by clicking on the audio buttons below. Personal historians: Your personal history jungle guides. He went on to tell me about hundreds of photos taken by his brother-in-law years ago and how daunting a prospect it was trying to figure how to digitize them and save them in a form his nieces and nephews could enjoy. Bob also said he was feeling a bit unsure as to how to approach preserving his own life stories; he found the prospect a bit intimidating and overwhelming. He just wasn’t sure how to start. I reminded Bob that, in addition to the technical and creative expertise I bring to the table as a video biographer, one of my skills as a professional personal historian is that of a guide. For a prospective client, contemplating how to embark on a legacy video project can be a bit like gazing at an expanse of seemingly impenetrable rain forest and wondering how you’re going to find a path through it – until your trusty jungle guide, machete in hand, starts hacking at the underbrush and creating a trail for you. So now Bob has a better idea of my role as a personal historian and video biographer. And when he’s ready to plunge into the jungle, he knows I’ll be there to lead the way.